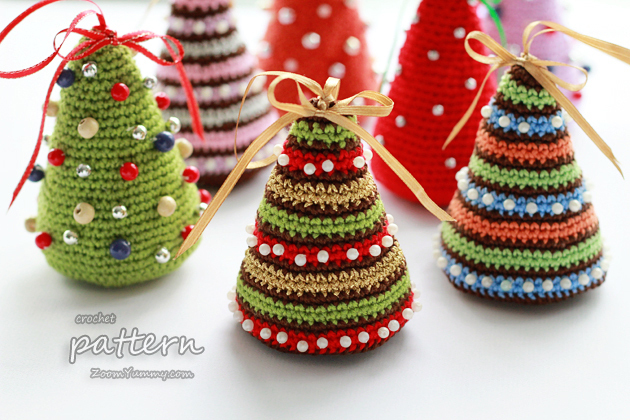 This is a crochet PDF PATTERN for ‘Little Colorful Christmas Trees’. The decorations that you can create with this pattern will be about 4 inches (10 cm) high and 2.5 inches (6.5 cm) wide. The pattern that you will receive is very detailed. It comes with a 22-page easy to follow written instructions and PHOTO TUTORIAL (!). It contains instructions both for the ‘Tree With Colorful Stripes’ and the ‘Single Color Tree’. The photo tutorial contains 40 (!) helpful STEP-BY-STEP pictures to make the project as easy to follow as possible. The pattern is written in standard American terms. It contains comprehensive information on supplies, abbreviation keys, stitch count and extra notes to help explain the process. Highly recommended even for BEGINNERS! Just Stumbled on this, and it’s adorable! I’ll definitely have to keep it in mind and check it out for next Christmas. I want this pattern. However I DO NOT use paypal? Is there another way that I can pay you for it. I have a Debit/Credit card. I have no idea how to even connect with paypal. I’ve never needed it.. I bought my pattern last week – when do you think it will arrive? Hi, I ordered this on 5th October 2017 and have not received the link. Is that a bit slow? Regards. Hello Susan! Thank you very much for your purchase and your message too! The system sends an email containing the link to a pattern immediately after the purchase, but from time to time these emails find their way to a spam folder, which might have happened in your case as well, I think. However, to make sure you receive your pattern asap I have just sent it to your email address now. If you still have trouble finding it, please let me know. Kind regards, Petra.